Island visited by 9 members. Why Scarriff is so named is something of a mystery, as it is quite some distance from the mainland in deep water. One possible solution is to interpret the name as Ir. garbh, 'rough', with a prosthetic s-, as happens with many other words, such as teach and creag. Scarriff Island is the 1275th highest place in Ireland. Scarriff Island is the most southerly summit and also the most westerly in the Dunkerron Mountains area. 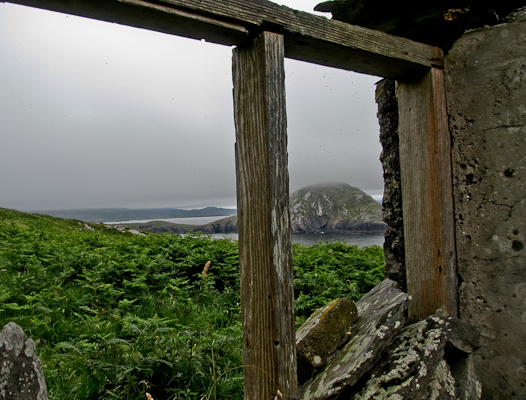 Back in 1911 Lawerence Shea and his wife Bridget would have looked out of this bedroom window at Deenish Island. He could not read or write and spoke only Irish. Five of his seven living children recorded in the census could and spoke Irish and English. In 1901 the same Sheas were living on the mainland in the townland of Coomatloukane. Two shepherds father and son John and Patrick Galvin shared the house on the island at that time. One of our boatmen said that a story goes locally that one of the Galvins once swam to the mainland to get help for a family member with appendicitis.